Aplus Finetek Sensor, Inc. is pleased to announce the availability of its latest new product, the FC/FD series of magnetic liquid level switch. The FC/FD series liquid level switch uses the principles of buoyancy and magnetism to provide a rugged and cost effective switch. From one to four switch points can be provided with a single FC/FD series unit, requiring only one penetration into the tank, a very cost effective solution for pump control, multipoint process control and many other applications. The FC/FD series magnetic liquid level switch can be provided with either plastic or stainless steel materials of construction and is designed to operate with liquids having densities of S.G. ≥ 0.45. Process connections can be either threaded or flanged of a wide range of sizes. 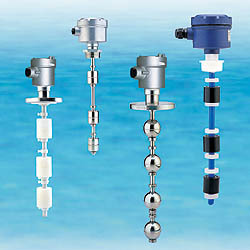 Anti-corrosive units, marine certified units and explosionproof versions are all available. The FC/FD units can be used in tanks with turbulent liquid surfaces that can be created by heavy inlet fill or agitation by the use of the “pipe shield” option that calms the fluid level within the pipe shield allowing for reliable operation of the floats. All flange mounted units can be equipped with a manual test function for applications requiring periodic verifiable operation. For more information look at our FC/FD series magnetic liquid level switch product page and contact Aplus Finetek Sensor, Inc. at 815-632-3132 or email us at info@aplusfine.com.